Our hometown Christmas show is always a highlight of our year. It has become a tradition, but we still like to switch things up a bit. 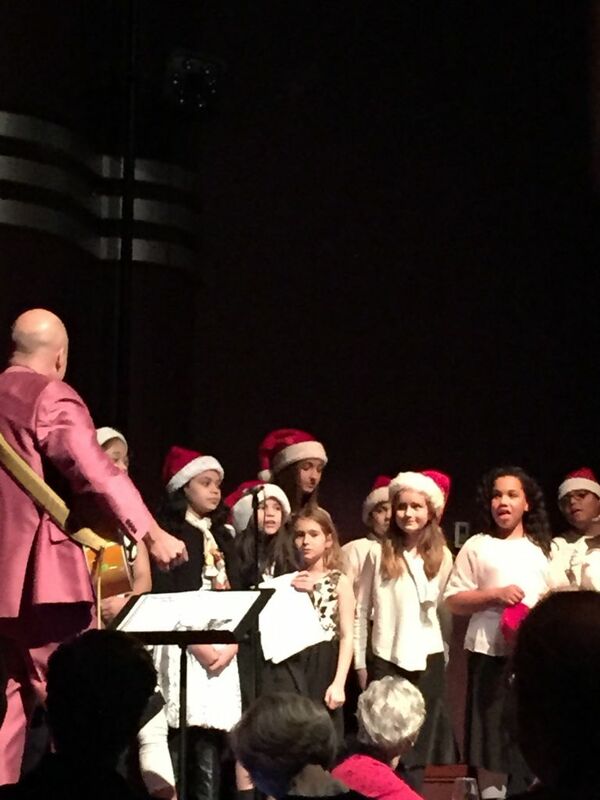 So this year, our “opening act” was the North Chevy Chase Elementary School Holiday Glee Club. A more enthusiastic group of fourth graders you will not find! Maybe you recognize their pink-suited conductor. Charlie served as “composer in residence” at the school for a week earlier this year, so when we needed some kid singers to add to the mix, he knew just where to go. We were thrilled to have a packed house at Bethesda Blues & Jazz. There is no better way to start the holidays than that. Along with songs from our Christmas album, we played some old favorites and premiered a brand new song called “Gin Fizz Fandango.” It is a strange and groovy tune in a slow three-four that features a bravura solo by Joe Jackson on trombone and a star turn by Marilyn Older on piano. We are looking forward to playing this song a lot in 2015! Ask any musician about January and you will get a grim smile, reflecting a woefully empty gig calendar. It has ever been thus. What to do about this? Start your next record! Well, that is what Chaise Lounge is doing, anyway. We began the new album in earnest last night with rhythm section recording sessions at Cue Recording in Falls Church, Virginia. Ken Schubert is engineering. As we were putting together the list of new songs to record, I was amazed at how many we have. Also I was reminded of how many times people have asked for recordings of these songs and I have blithely tossed off, “Oh, that will be on the next CD.” “The Coolest Car” is one of those. Another is “I Just Want All Of My Stuff.” Maybe the most-requested unrecorded song is Gary’s solo piece, “Losing Streak.” All of them are coming soon. I’m not completely sure yet, but I think the new album will be called “Dot, Dot, Dot.” Yes, that song too is coming. The first session was a delight. It was great to get back in the studio. And it felt good to dig into the fine details of some of those tunes. “Via Con Me” is a deceptively tricky song to play well. If the tempo is not exactly right it doesn’t work. We have also unearthed some of our back catalog for this. Who remembers “Celestial Navigation”? I think we played that twice…maybe at IOTA? Well, here it comes. And there is a song about a wrecked Airstream trailer (title still in flux)—who remembers this? It may be the saddest song in the world; too sad, we decided, to play much live. Last year we released two records (Insomnia, A Very Chaise Lounge Christmas). This year, it will be only one. But I have a feeling it will be a doozy.